As of Tuesday afternoon, the Chinese mainland box office had brought in a total of 59.39 billion yuan ($8.63 billion). With a week still left to go, that's over 3 billion more than the 55.9 billion yuan earned last year. While this is mere steps away from the 60 billion yuan goal predicted by media at the beginning of the year, this year's record just doesn't seem that worth celebrating. The Chinese film industry got off to a good start in the beginning of the year, but experienced tough times in the following months. In February, the month of the Chinese New Year holiday, three films managed to pull in 2 billion yuan each, pushing the monthly box office to 10.15 billion yuan. However, looking at the rest of the year, monthly box-office revenue dropped below 4 billion on six occasions. 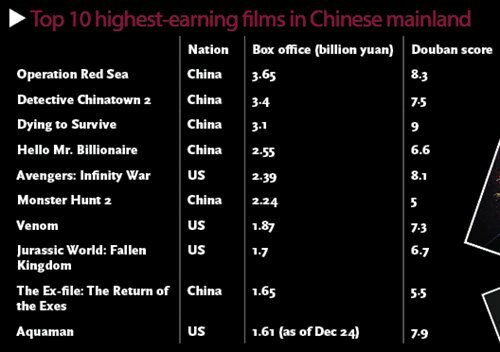 As of Monday, the highest-earning film of 2018 is Operation Red Sea with 3.65 billion yuan, followed by Detective Chinatown 2 (3.40 billion yuan) and Dying to Survive (3.10 billion yuan) - all Chinese films. 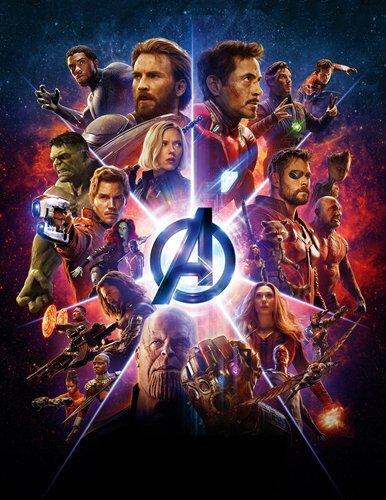 Only four imported films entered the top 10 this year, among them only Avengers: Infinity War (2.39 billion yuan) broke into top five. Statistics on Chinese ticketing platform Maoyan provide further evidence that Chinese films are faring well against imported competition, 29 of the top 50 highest-earning films of the year were domestic films. While Hollywood films have been the "poster child" for films imported into China for years, Indian films were an important part of this year's box office. A total of nine Indian films have been released in Chinese mainland theaters so far this year, with one more, Thugs of Hindostan, due out on Friday. This number is almost three times that of 2017. Looking at the box office performance of Indian films in China, four raked in more than 100 million yuan, not a bad feat considering that prior to 2017 Indian films rarely made more than 10 million yuan. Some Chinese media outlets have been using the term the Matthew effect - the idea that the rich get richer and the poor get poorer - to describe the market performance of this year's films. 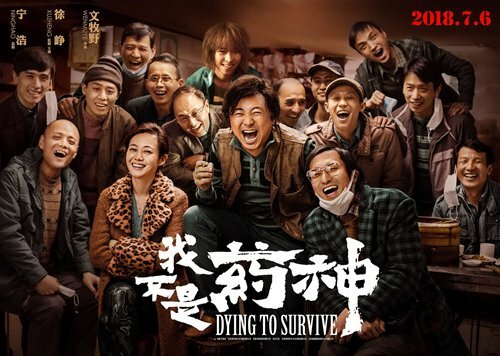 According to a report on Xinmin Evening News, 15 films, just 3 percent of the films released this year, accounted for 55 percent of box-office earnings, while more than 77 percent of films contributed only 2 percent. 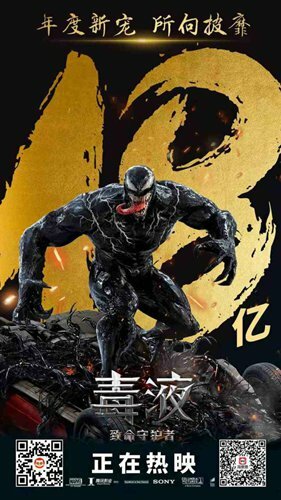 "With the rising quality of domestic films, hit films came one after another… but when huge audiences are drawn to these hit films, the rest suffer a bigger crash," wrote Yingyi Dushe (Poisonous Words on Film), a Chinese WeChat public account, citing statistics from film database EntGroup. "In 2017, the top 10 films accounted for 36.4 percent of the total box office. But in 2018, that percentage has risen to 42.4 percent," it added. Changing audience tastes has also had an impact this year. Compared with previous years when popular stars and well-known IPs were the biggest draws for films, the concept of "content is king" has become more widely accepted. On Sohu Entertainment's list of the top 10 financial flops of the year, many were big budget films that failed to bring in audiences with their big-name star casts. Fantasy film Asura is the most outstanding example. With a rumored budget of 750 million yuan, the blockbuster starred A-list actor Tony Leung and actress Carina Lau, as well as pop star Wu Lei. However, Asura ended up only earning 50 million yuan at the box office and was pulled from theaters after only three days. Dushe Yingyi also noted that, according statistics from China Film News, there were 59,009 screens in the Chinese mainland as of November 30, a 16.2 percent increase from 2017's 50,776 screens. That is a much smaller increase compared with 2016's 30.2 percent growth and 2017's 23.3 percent. The surge in the number of screens in China's third- and fourth-tier cities was once a major driving force behind the growth of the Chinese film industry but now that bonus can no longer be counted upon. According to a report from news site Q Daily, third- and fourth-tier cities accounted for 34.58 percent of total ticket sales in the mainland in 2015. This percentage continued to grow at roughly approximately 27 percent annually in third-tier cities and at 35 percent in fourth-tier cities to reach roughly 38.75 percent of total ticket sales in 2017. Yet ticket sales in these cities remain virtually unchanged this year, a sign of a major slowdown in growth.